What is a Fido’s Fences brand pet containment fence? 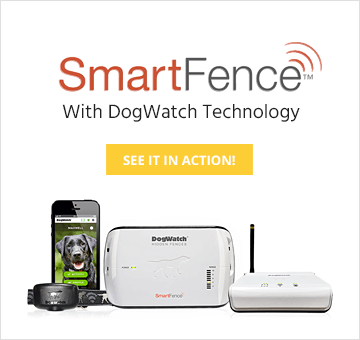 The Fido’s Fences electronic dog and cat fence is a pet fencing system that uses an electronic radio signal to keep your dog WITHIN a designated containment area, such as a yard; or OUT of an area, such as a swimming pool, patio, or garden. Our pet containment fences also work in the interior of your home to keep your pet off a couch or away from a kitchen counter. A hidden wire, buried underground, carries the harmless low-level radio signal around the containment area. Your dog wears a receiver on a collar that emits a mild stimulation, or correction, when he gets too close to the designated area. With an indoor dog containment fence, the hidden wire runs around your couch or other containment area and is not visible to the eye. Will the pet fencing system work for more than one pet? Yes. There is no limit to the number of pets our electronic pet fencing can protect at one time. Each pet will need his or her own receiver collar, and new animals must be trained. An auxiliary power, available separately or included in certain packages, can supply provides hours of power to your electronic pet containment system until your household electrical service is be restored. Once you purchase the pet containment system, you may expand it or take it with you when you move. Your pet will require re-training. 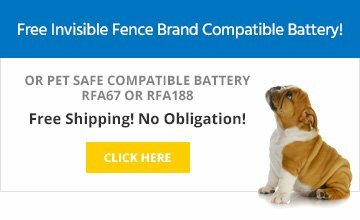 Is my yard too small / too big for an electronic fence? Our systems have been successfully installed on properties ranging from small urban yards to large orchards. The system is very customizable to meet your unique needs. Fidos Fences offers models that can cover properties with up to 4,000 feet of wire. You can contain your pet in or out of most anywhere, including interior features of your home such as couches, dining rooms, and counter tops. Contact us for a free consultation and estimate with a trained professional pet consultant. How old does my dog have to be to be ready for a pet containment system? As a general guideline, your pet should be at least 4 months old. However, some dogs may mature earlier than others because of breed, size or disposition. If your pet can follow the three basic commands of come, sit, and stay; they may be ready for a Fido’s Fence brand pet containment system. When our pet consultant meets with you and your pet, he or she will evaluate your dog and make a recommendation as to when training should begin. Will a system work with any pet? Our systems work with cats and dogs of all breeds, ages, and sizes. However, this type of product is not intended for use with animals that have a history of aggressive behavior. Will the stimulation from the collar hurt my pet? Absolutely not! The type of stimulation used by the electronic fence system has been used in dog training for over 40 years, and has stood the test of time as a safe and effective means of behavior correction. All electronic pet fence systems emit a correction that is less than 25% of the energy found in a static electricity shock that most people have experienced. The amount of correction can be adjusted so that a dog receives the appropriate level of stimulation for its size. Our products are used and recommended by veterinarians. I think my fence is broken. What should I do? If it’s been 3 months or more since you changed the battery, that may be your problem. Change the receiver battery first and see if that fixes the problem. If you’ve recently changed the battery or the system still isn’t working after you install a fresh Fido’s Fences battery, check whether the collar is tight enough. If you can fit more than one finger between the dog’s neck and the receiver prongs, it is too loose. If the transmitter for your fence is making a loud noise (alarm), there is probably a break in your fence wire. Wire breaks are usually a result of recent work on your property like landscaping, tree planting or removal, installation of a regular fence, etc. That would be the best place to start looking for the break in the wire. If the transmitter is making a loud noise intermittently – stopping and starting – this usually indicates a partial break in your fence wire. A technician will only be able to diagnose and repair this if they are at the property when the alarm is sounding.